Here's where you can find the new RoboCop movie: Robocop [Blu-ray]. Inside, New Earth Police officers rushed into position as a white laser beam penetrated the closed door. The military police officers grabbed their weapons hanging on the blue wall, moving in single file, letting the veterans barricade the front line with five-foot-tall energy shields. The head police clanked their frontal shields against the ground in a domino wave as the others hurried behind them. The commander stood in the back, shouting orders of alignment. "Remain behind shields. Prepare to block incoming fire!" the commander barked, his voice echoing across the half-circle training room. "When I give the command, and only when I give the command, you will fire! Understood?" "Sir, yes sir!" the group of 50 acknowledged. The last officers hurried down the middle aisle and took position, remaining still and silent in the open-floored room. They watched the laser beam disappear and heard a loud screech echo from the walls. It was an overbearing metal scraping sound like claws digging through a slate board. As the cutout grinded from the hole, sweat from police officers' foreheads rolled down their faces, but they wouldn't dare remove their helmets. At last, the three-inch-thick oval tipped over and crashed. Smoke fumed from the entrance as a figure in a red powersuit casually ducked through the entrance and paced toward the military police. Botland stopped in front of the two rows of policemen and peered through the middle at the commander. "Surrender, or we'll open fire!" Sable warned. The intruder didn't respond. He simply tilted his head and tauntingly raised his arm, pointing at the commander as if provoking an attack. The men and women in the front line, with their rifles in position against their shields, unleashed the first wave of gunfire even before the commander had finished speaking. Piercing Ira bullets slipped through streams of air molecules, impacting the intruder. The room was quickly engulfed in smoke. 1. Those who don't have time to read the story and want a quicker version of it. 2. Those who want to refresh their memories about previous chapters they read. You can use cheat codes to speed through video games, so why can't you do the same with books? These summaries are filled with spoilers from my VECTO book, so beware! Disclaimer: Don't cheat in school, or Vecto will consider you a traitor. And if you read the book, you'll know what he does with traitors! 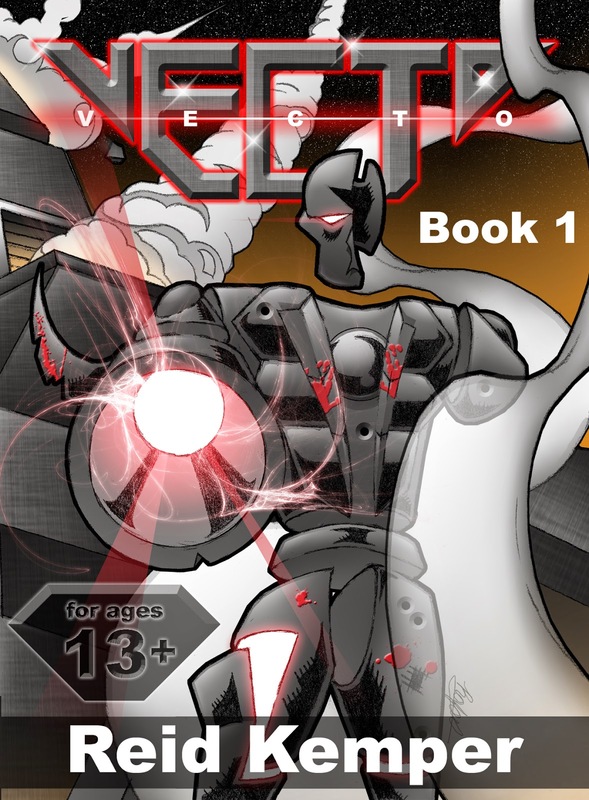 Vecto, a robot that's part of a group of fighters called the Alpha Squad, wakes up as his friend and teammate Gyro puts together Vecto's new body. His body was destroyed save for an orb called the Flummox Capacitor, which is his power source. The orb creates invisible shields that also can amplify his voice. Vecto had sacrificed himself to save Gyro from being killed by their arch nemesis Morphaal, who had conquered planets and committed mass murder. Because of cost and availability, his teammate Gyro makes Vecto's body using solid parts connected by wires instead of Vecto's old body made with Dinishmen technology. That body consisted of floating parts that used laser conduction instead of wires. Gyro has a pitch-black body with unique DNA, has solid green, concave eyes, and doesn't have a mouth (he speaks through the cells of his body). As he puts together Vecto's body, he thanks him for his sacrifice since it gave Gyro enough time to disintegrate Morphaal with his Giga Ball energy attack. He comments that Vecto shouldn't talk robotic since he has emotions. After waking up, Vecto realizes that they on a planet called Acaterra in Gyro's quarters. The room contains Gyro's rest capsule, a hologram of his ex-girlfriend Charisma, and a framed cross on a wall. Since the Alpha Squad was created to defeat Morphaal, Vecto questions what their purpose was. Gyro jokes that they disband and raise a family but says that he would always stay with the Alpha Squad since it's more exciting than "standing guard on Hodos." Other members are Phantom and Shadow. Phantom is a black-and-brown-cloaked figure who wears a hood. He opens the door and tells Vecto and Gyro that they have a mission to take down one of Morphaal's henchmen who survived. It's revealed that Vecto was replaying internal memory data of the time Gyro repaired his body. That event happened years ago in the same room Vecto was in. Although Gyro got to create Vecto's body with floating parts and laser conduction, that body was destroyed as well and Vecto was creating another one for himself. The only thing left working from his body was one of his oddly shaped feet. Vecto uses his foot's Air-to-Ice function within his shields to freeze valignium, also known as tyrannium, which weakens in extreme cold instead of vice versa. He then curves his shields to mold the valignium into body parts. As he creates his body, he misses having Gyro around but disregards it as a programmed response. He questions why Gyro sacrificed his life to save him since Vecto considers himself a replaceable machine. He wonders if the outcome could have been different if he was stronger, if he had stop Morphaal's henchman beforehand, if the Alpha Squad had disbanded after Morphaal's death, and if Phantom wasn't also dead. Vecto's servant, Azul, then opens the door. He has blue skin, wears gold and white, and has several silver bracelets. Azul tells Vecto that Morphaal has been revived. Here's where you can find the 2009 movie: Star Trek [Blu-ray]. Here's where you can find the book: Ender's Game: 1 (The Ender Quintet).